In other words, it is possible that much of the international left has been misled about the violence in Venezuela; thinking that the government is the only one responsible, that President Nicolas Maduro has declared himself to be dictator for life (though he has actually confirmed that the presidential elections scheduled for late 2018 will proceed as planned), or that all dissent is punishable with prison (disputed by major opposition leader, Leopoldo Lopez – who was partly responsible for the post-election violence in 2014 – recently being released from prison and placed under house arrest). Let’s take a brief look at each of these claims one by one. First, regional elections (state governors and mayors) were indeed supposed to take place in late 2016, but the National Electoral Council (CNE) postponed them with the argument that political parties needed to re-register first. Leaving aside the validity of this argument, the CNE rescheduled the elections recently for December 2017. This postponement of a scheduled election is not unprecedented in Venezuela because it happened before, back in 2004, when local elections were postponed for a full year. Back then, at the height of President Hugo Chavez’s power; hardly anyone objected. As for the recall referendum, it was well known that it would take approximately ten months to organize between its initiation and its culmination. However, the opposition initiated the process in April 2016, far too late for the referendum to take place in 2016 as they wanted. If it takes place in 2017, there would be no new presidential election – according to the constitution – and the vice-president would take over for the remainder of the term. In other words, none of the arguments against the democratic legitimacy of the Maduro Government hold much water. Moreover, polls repeatedly indicate that even though Maduro is fairly unpopular, a majority of Venezuelans want him to finish his term in office, which expires in January 2019. As a matter of fact, Maduro’s popularity (24% in March, 2017) is not as low as several other conservative presidents in Latin America at the moment, such as that of Mexico’s Enrique Pena Nieto (17% in March, 2017), Brazil’s Michel Temer (7% in June, 2017) or Colombia’s Juan Manuel Santos (14% in June, 2017). Now that we have addressed the possible reasons the international left has been reluctant to show solidarity with the Maduro Government and the Bolivarian socialist movement, we need to examine what “neutrality” in this situation would end up meaning – in other words, what allowing the opposition to come to power via an illegal and violent transition would mean. First and foremost, their coming to power will almost certainly mean that all Chavistas – whether they currently support President Maduro or not – will become targets for persecution. Although it was a long time ago, many Chavistas have not forgotten the “Caracazo” – when in February 1989, then-president Carlos Andres Perez meted out retaliation on poor neighborhoods for protesting against his government and wantonly killed somewhere between 400 and 1,000 people. More recently, during a short-lived coup against President Chávez in April 2002 the current opposition showed it was more than willing to unleash reprisals against Chavistas. Most do not know this, but during the two-day coup over 60 Chavistas were killed in Venezuela – not including the 19 killed, on both sides of the political divide, in the lead-up to the coup. 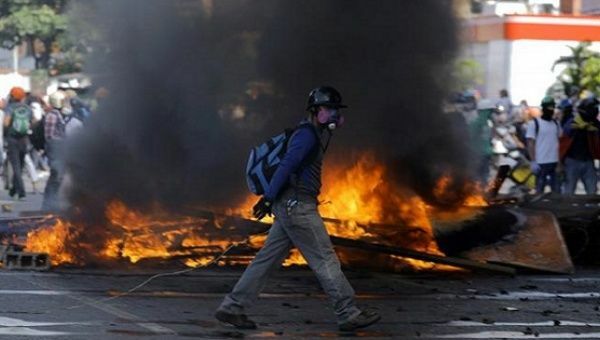 The post-election violence of April 2013 left 7 dead, and the Guarimbas of February to April 2014 left 43 dead. Although the death count in each of these cases represented a mix of opposition supporters, Chavistas and non-involved bystanders; the majority belonged to the Chavista side of the political divide. Second, even though the opposition has not published a concrete plan for what it intends to do once in government – which is also one of the reasons the opposition remains almost as unpopular as the government – individual statements by opposition leaders indicate that they would immediately proceed to implement a neoliberal economic program along the lines of President Michel Temer in Brazil or Mauricio Macri in Argentina. They might succeed in reducing inflation and shortages this way, but at the expense of eliminating subsidies and social programs for the poor across the board. Also, they would roll back all of the policies supporting communal councils and communes that have been a cornerstone of participatory democracy in the Bolivarian revolution. So, instead of silence, neutrality or indecision from the international left in the current conflict in Venezuela, what is needed is active solidarity with the Bolivarian socialist movement. Such solidarity means vehemently opposing all efforts to overthrow the government of President Maduro during his current term in office. Aside from the patent illegality that overthrowing the Maduro Government would represent, it would also literally be a deadly blow to Venezuela’s socialist movement and to the legacy of President Chavez. The international left does not even need to take a position on whether the proposed constitutional assembly or negotiations with the opposition is the best way to resolve the current crisis. That is really up to Venezuelans to decide. Opposing intervention and disseminating information on what is actually happening in Venezuela, though, are the two things where non-Venezuelans can play a constructive role.